HRA is house rent allowance paid by company to meet your rent expenses. HRA is tax free up-to an amount based on 3 rules defined by Income tax department. Use this HRA calculator online to find your HRA tax rebate. Open HRA tax exemption calculator in new window. If you are a salaried professional and living in a rented house, HRA exemption is one of the biggest tax saving option, under Section 10 (13A) of the Income Tax Act. For self employed , HRA tax deductions under Section 80 GG are available. You can claim the HRA Income Tax exemption even if your employer does not provide HRA allowance as exempted allowance on ITR (Income tax return). Calculate the HRA exempted amount using the above calculator and mention that amount on your ITR (Indian Income Tax Return) as ‘Exempted allowances‘. Your final tax refund will increase based on the exempted HRA amount. documents required to claim HRA tax exemption include rent receipts if rent per month is greater than 3 thousand rupees per month. You can claim both HRA and Home Loan tax exemption as per Income tax rules. If you have rented a house for yourself and paying home loan EMIs, you can claim income tax exemption for both at the same time. The owned house should be in a city which is too far to travel daily from your work location like 50+ kms away. There is no documented Kms limit in the tax laws though but 50+ is considered safe to claim and convince income tax officer. Can I pay rent to my wife or spouse or parents to claim HRA tax benefit? You can pay house rent to your wife or parent legally and claim HRA. In the eyes of Income tax, each individual is a separate entity and hence can have his own income. Actual HRA received during the financial year. HRA (one of the component of your salary package), is actually defined by your Basic salary in most cases. i.e. it is normally 40% or 50% of your basic salary. For basic salary of INR 10,000 per month, your HRA component would be either INR 4000 or INR 5000. The 40% or 50% factor is dependent on your specific employer policy. The HRA income tax rebate of either picking 40% or 50% is defined by your residence location METRO status eligibilty. Paying Rent equal to HRA Allowance? Paying rent same as HRA allowance will not give you maximum HRA tax exemption as rules are clever. If you are declaring rent of Rs. 5000 per month considering that you are declaring more than your HRA amount i.e. INR 5,000, would not make any difference to final tax exemption, then you are wrong. Quickly running through the 3 rules would make things clear here. If you scan carefully, you are only eligible for Rs. 48,000 as tax deduction even though your yearly HRA and rent-paid (and declared) amount is 60,000. Income tax officials have designed the rules so cleverly that you will always end up getting the least tax HRA tax rebate if you look at the HRA component alone. 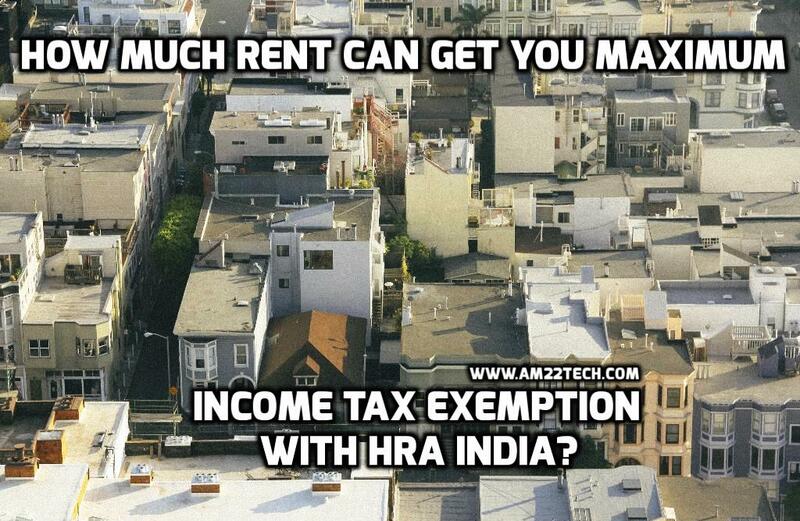 How to get maximum HRA exemption? 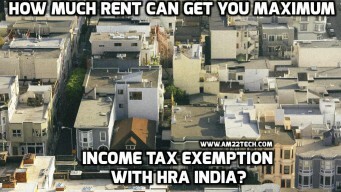 The HRA income tax rules are based on basic salary, HRA amount and rent paid/declared. You can’t change basic salary and HRA component. Hence, the idea is if you pay a rent figure which brings the amount in all three rules equivalent to the maximum of three, you would be eligible for maximum tax rebate. If you look at the least amount now, it is INR 60,000 which is equal to the maximum of three values too. Please use the calculator given above to find out how much tax exemption you can get. sir I hv shifted in rental home on 15 may 2018.I am working in govt sector.Received HRA 13656 per month and paying rent rs 27000 pm.Now at the end of financial year how could I calculate HRA rebate.plss clear if anyone shifted home in the mid of the year like me..
You can use the calculator given above to calculate your HRA tax exemption. My employer is giving me 1800 monthly as H. R. A. DO I need to submit receipt for the hra tax exemption?? Documents required for HRA Tax claim. If your total HRA is 1800 per month, you may not need to provide any proofs. Please read the article above. It has details about paying rent to wife/parents.